Strato I was an Indo-Greek king who was the son of the Indo-Greek queen Agathokleia, who presumably acted as his regent during his early years after Strato's father, another Indo-Greek king, was killed. 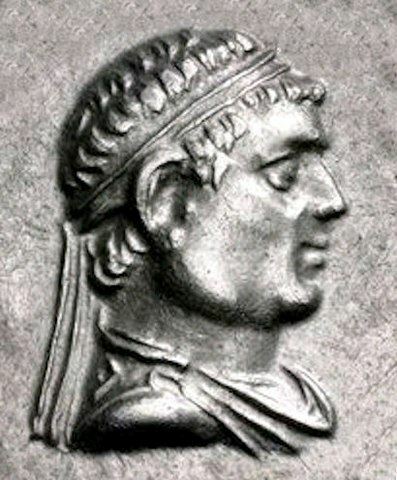 Until recently, consensus was that he ruled between c. 130–110 BCE in Northern India and that his father was the great king Menander I. Menander ruled the entire Indo-Greek empire, but in this scenario, the western parts including Paropamisade and Arachosia, gained independence after the death of Menander I, pushing Strato and Agathokleia eastwards to Gandhara and Punjab. The modern view suggests that Strato I was a later king, perhaps ruling from 110–85 BCE, though perhaps still a descendant of Agathokleia. In this case, Agathokleia was the widow of another king, possibly Nicias or Theophilus. A third hypothesis suggests that coins of Strato I in fact belong to two kings who both may have ruled around 105–80 BCE, though in different territories.